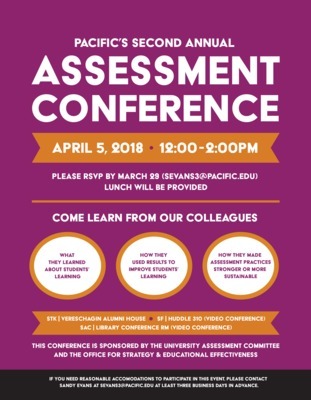 Faculty, staff and students were invited to Pacific's Second Annual Assessment Conference "Learning from Each Other." The conference took place on April 5, 2018, from noon to 2pm. This was a three-campus event via videoconference, with lunch provided. University faculty and staff showcased program assessment practices sharing their creativity, innovation and expertise in assessment. Attendees had an opportunity to come learn from their colleagues! What they learned about students' learning? How they used results to improve students' learning? How they made assessment practices stronger or more sustainable? This conference was sponsored by the University Assessment Committee and the Office for Strategy & Educational Effectiveness.